We’ve had plenty of snow. Tons for Virginia, anyway. 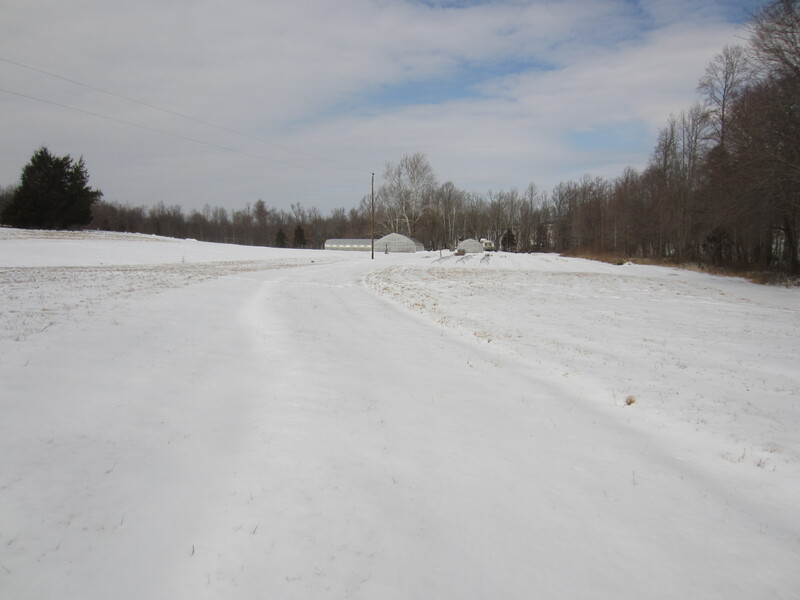 It’s much easier to see how the ground lays when there is a bit of snow. 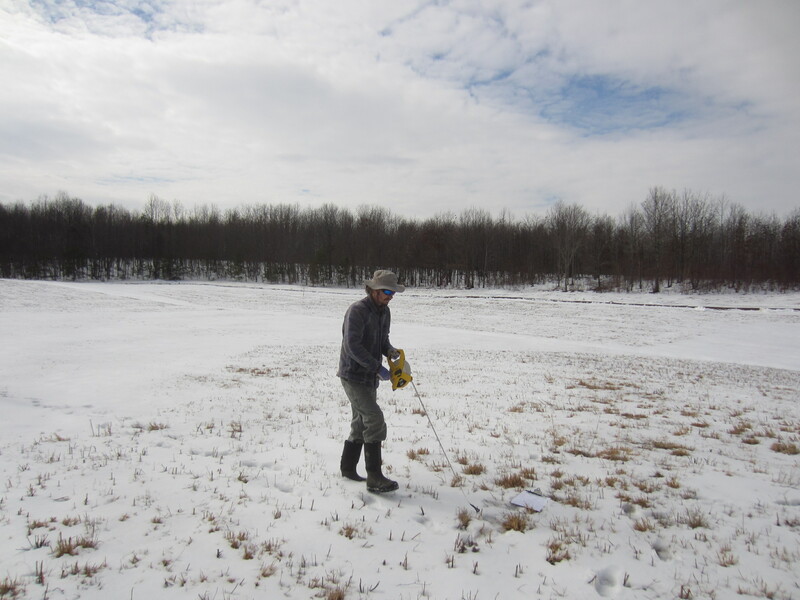 As it melts you can also get a better sense of warmer or colder microclimates related to the aspect of the land. 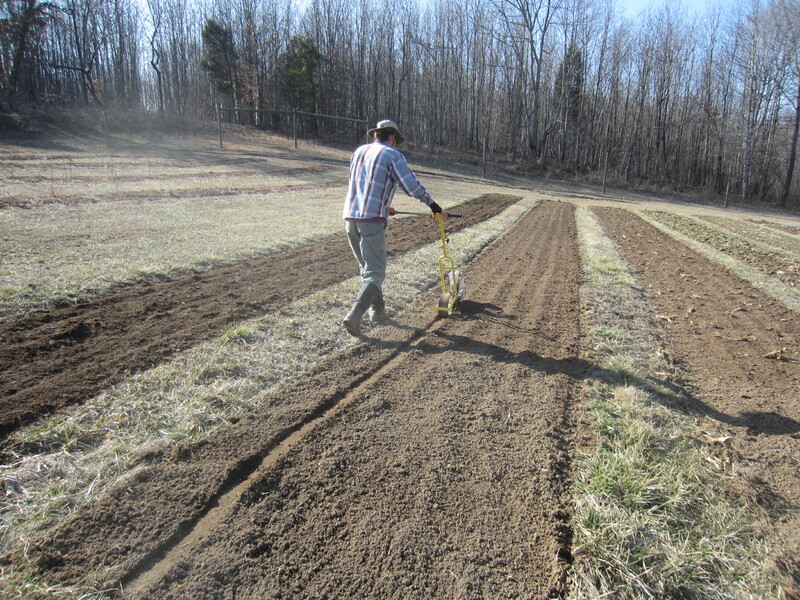 Our land has been cultivated in the past, and there is a large drainage swath down the center of our big field. 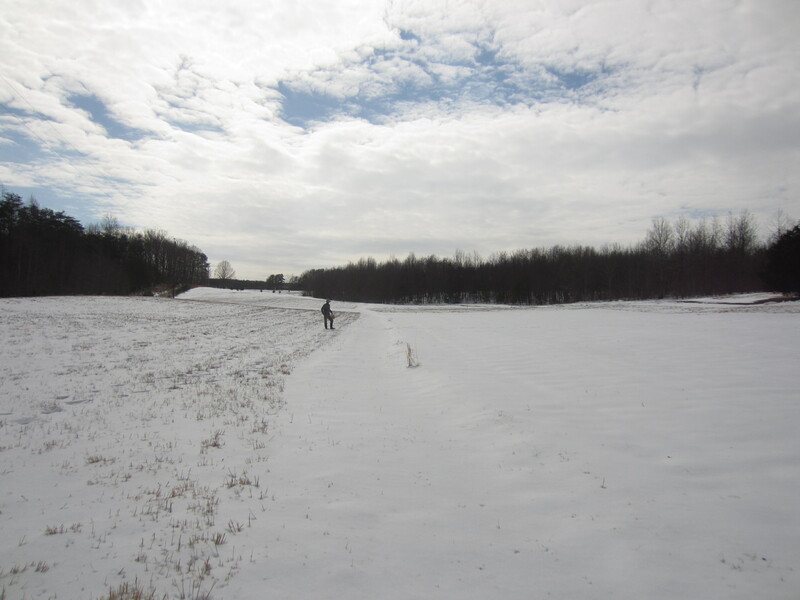 It’s easy to see even when there isn’t snow on the ground, but this and many other land features really dictate how we lay out our growing areas and infrastructure. We spent a bit of time measuring and plotting the expansion. Soon this land will all be enclosed by deer fence! 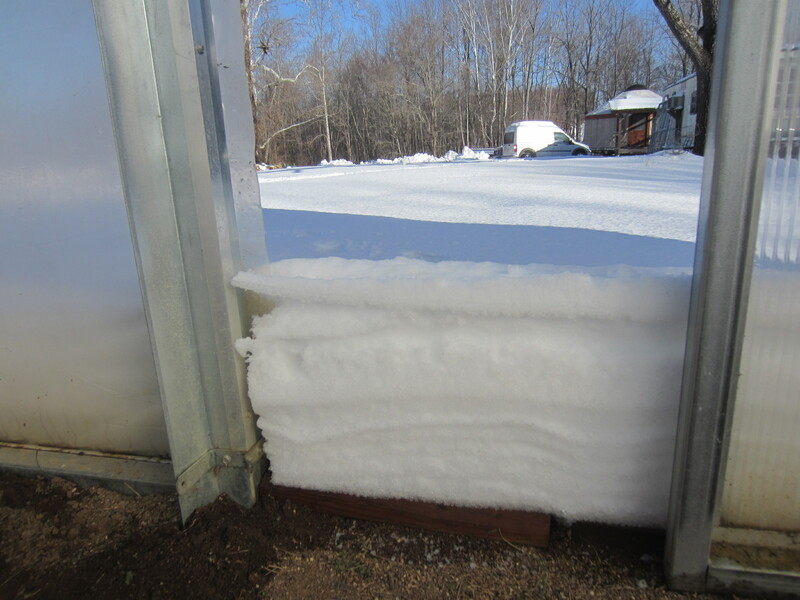 Snow building up on a door to one of the tunnels. 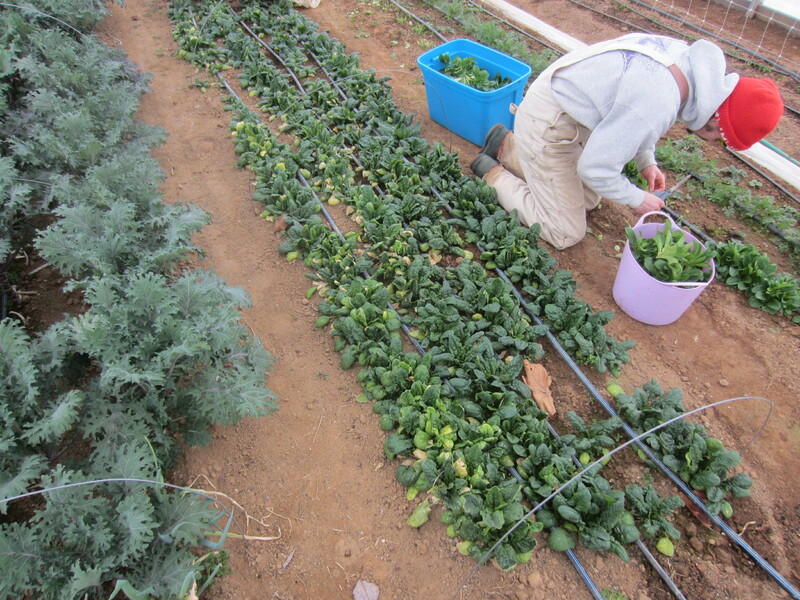 Harvesting for an early March market. I inoculated 164 logs with shiitake spawn this year. 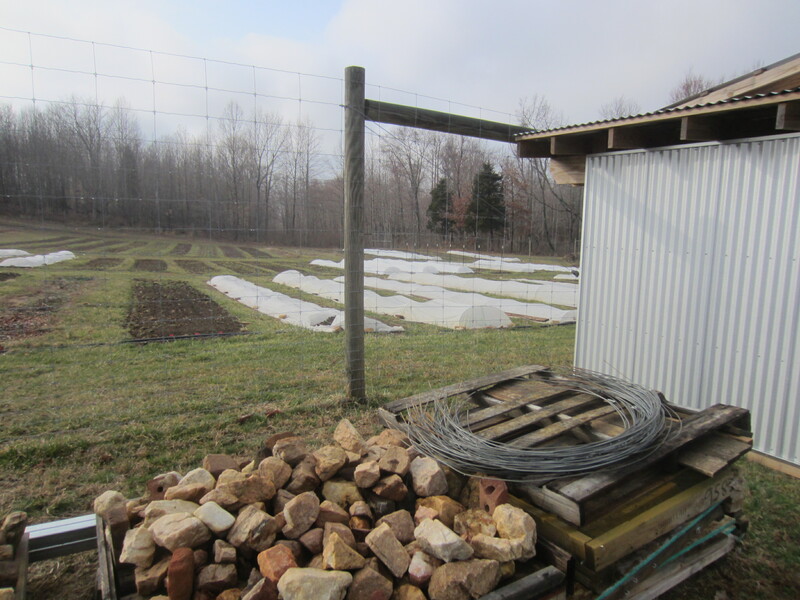 Our log yard is really starting to grow! We are realizing our situation down by the creek is not quite shady enough, at least in the winter. It looks like there are a lot of trees around but they are all deciduous and the lack of leaves makes a big difference. We are hoping to move the operation up behind the potting house inside the new deer fence at some point soon, and erect a shade structure to cover it. 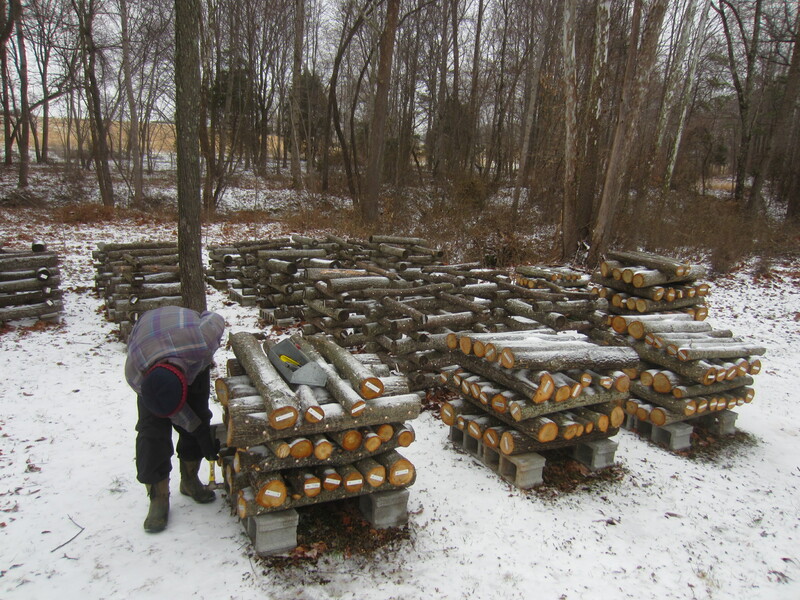 Then the logs will be protected from the roving deer and squirrels that like the mushrooms as much as we do. 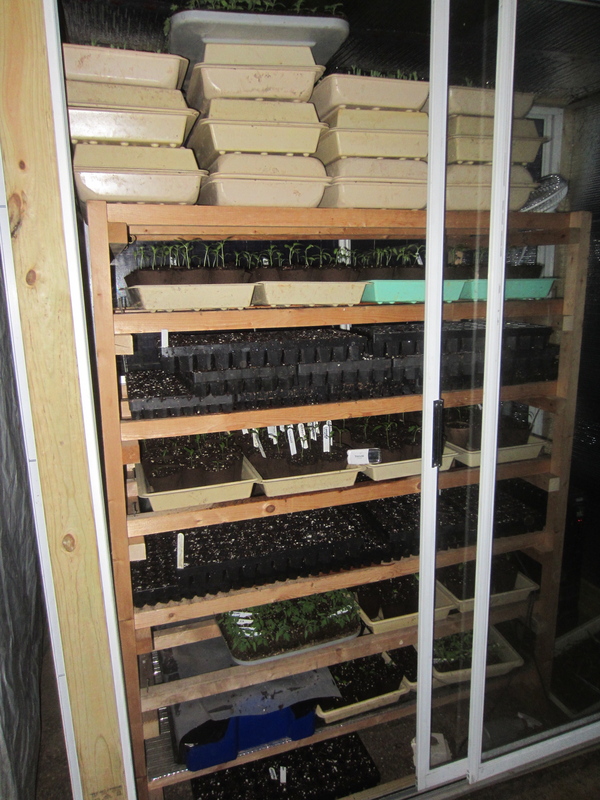 We sectioned off half of the potting house with used greenhouse plastic to heat a smaller area for our transplants. Our wood stove is great but the house is a little big for it to heat efficiently. We hope to have a more automated system in the future, as waking up the stoke the wood stove twice a night (and walking to the potting house from the yurt in frigid weather) is a bit challenging for those of us who need sleep to function properly. 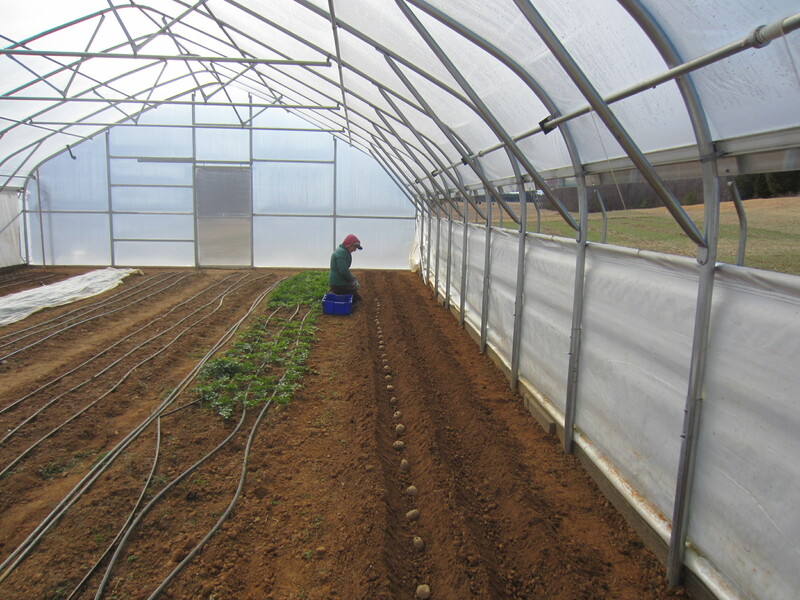 Planting ‘early’ potatoes in the big tunnel. We had hoped to get these in a bit earlier but the temperatures were so cold I kept putting it off. Still, we should have a crop earlier than those planted outdoors. 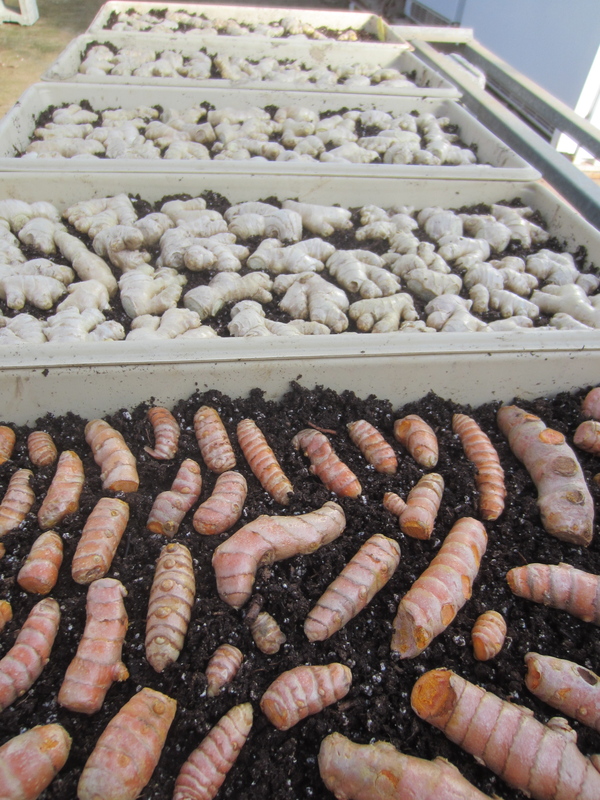 Starting ginger for another year of delectable tubers! We are also attempting to grow turmeric this year. That’s what those orange pieces are: fresh turmeric! Look for it at market in late fall. Trying my hand at grafting tomatoes this year. So far my results have been decent with most of the grafts surviving. 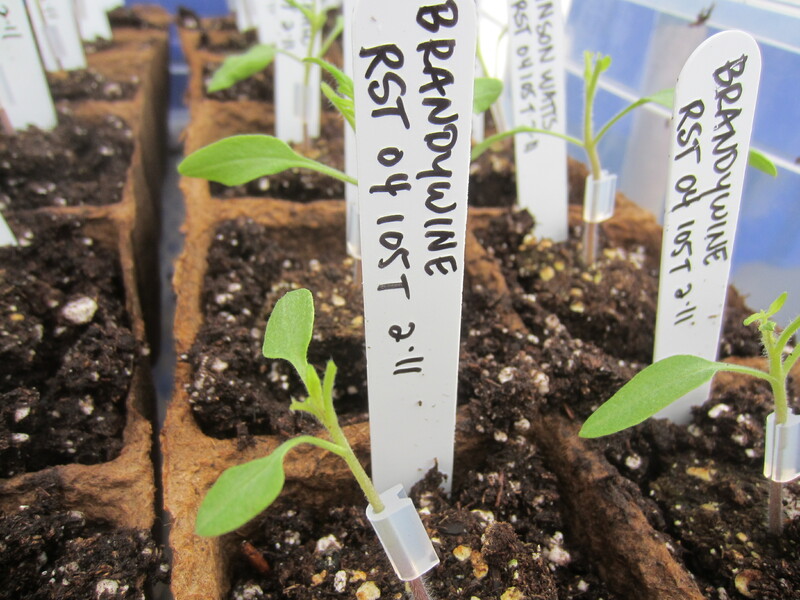 The hope is the grafted plants will exhibit more vigor and resistance to soil-borne diseases. The heated chamber chock-full with plants!!! I’d like three more of these!! 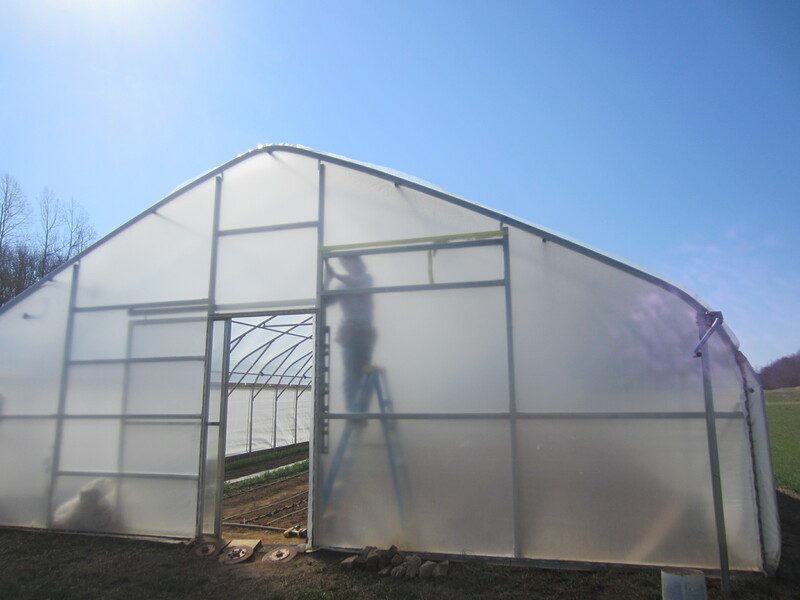 We beefed up the tunnel structure in anticipation of it supporting lots of weight from trellised tomato plants. 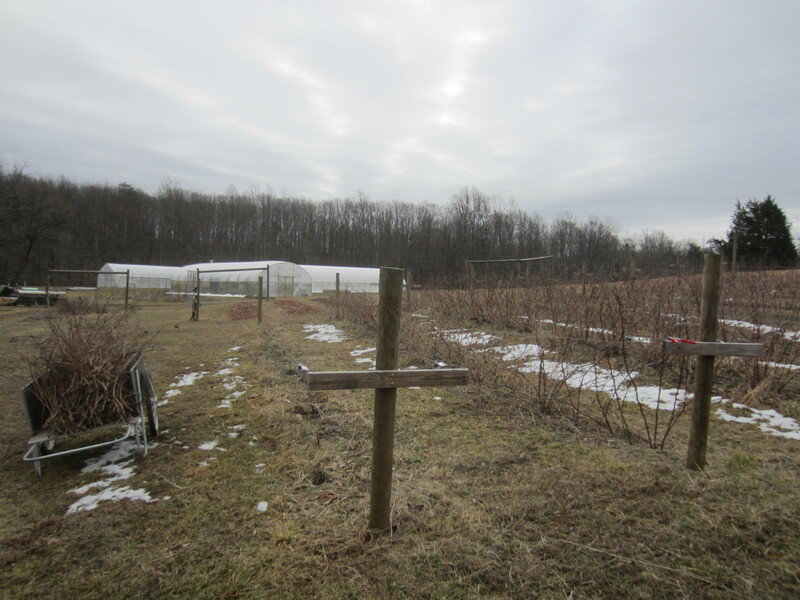 We pruned all our raspberries. And pruned all the blueberries. Also replaced several of the plants that did not survive. 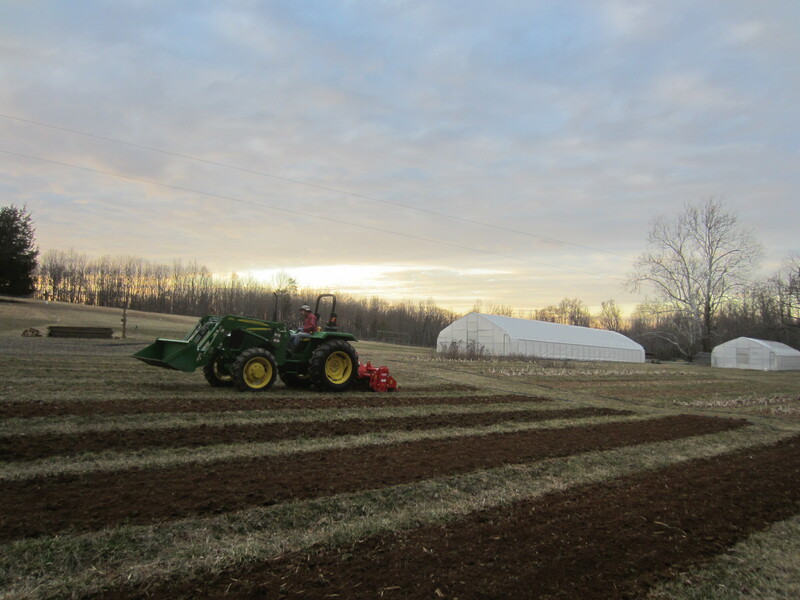 Despite all the snow and wet weather, we’ve had a few brief chances to get the ground ready for spring planting. And we sowed a few seeds. And covered everything to protect from these frozen-ground 20 degree nights we’ve been having of late. Our fence project is finally gaining some momentum. Gavin cut down an old willow tree that was mostly dead and encroaching on the new fence. There was actually a mulberry tree growing up through the dead willow. That’s what you see sticking up from the mostly hollowed-out tree stump! 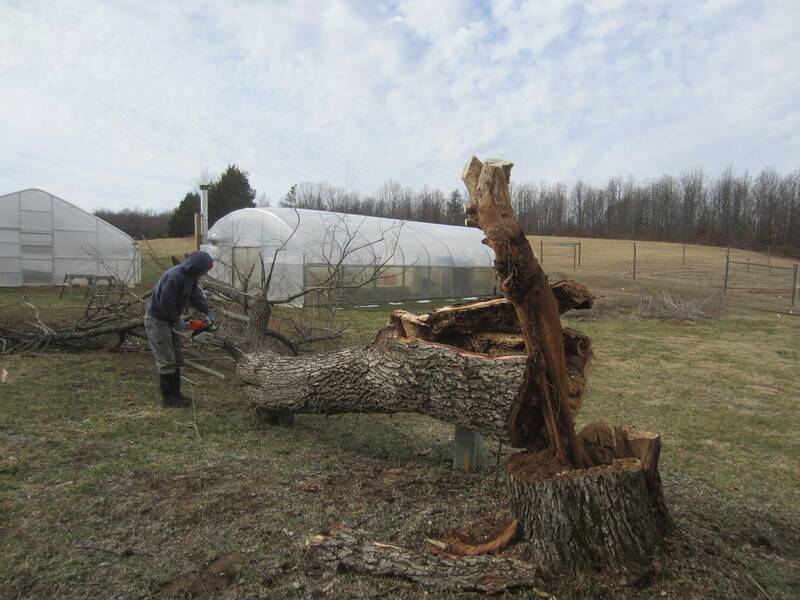 We also had a big walnut tree removed. I for one will be glad not to have to trip over walnuts every time I walk out to work. The squirrels might not be so happy they’re gone, but we have plenty of walnut trees in other areas. At long last the huge pile of fence posts are in the ground! 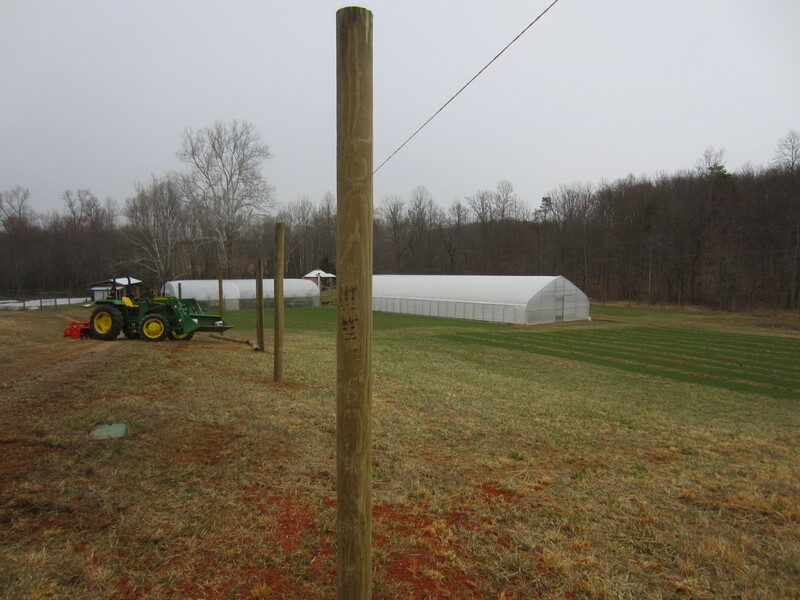 Our fence contractor crew came and in one day set all 112 posts. Now we wait for the concrete to set up (and the weather to allow them to return and finish the job). 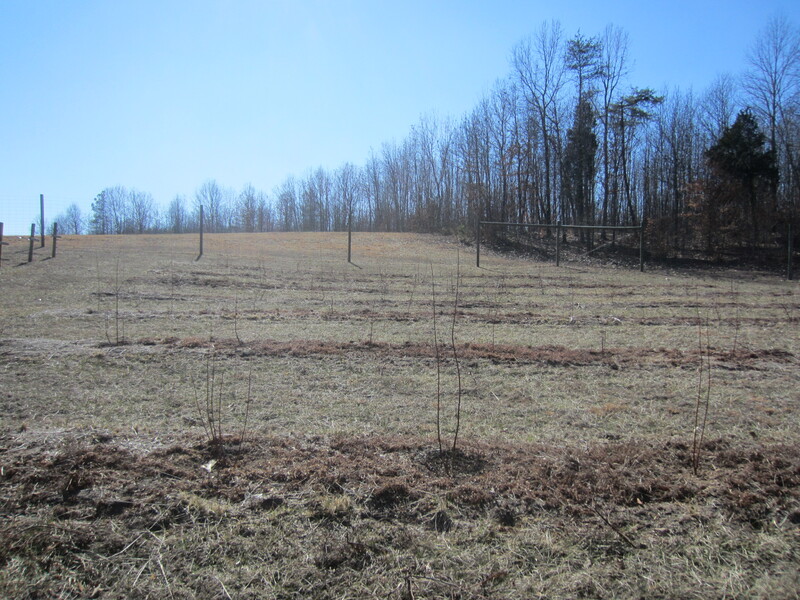 Then the woven wire will be pulled and stapled creating another 6 acres of deer-free farmland. Farming – deer = one less thing to worry about. Yippee! 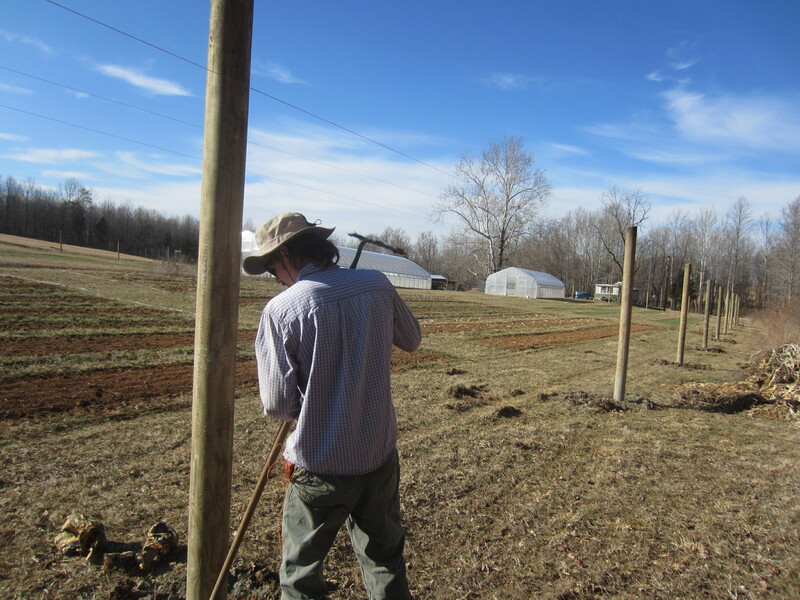 Gavin has been raking out the lumps around each post (this is days of work right there) so that when the grass starts to grow and we have to mow we won’t be running through a bunch of dirt clods. You can really see the cover crops greening up in the picture above!!! Spring is here, I do believe. 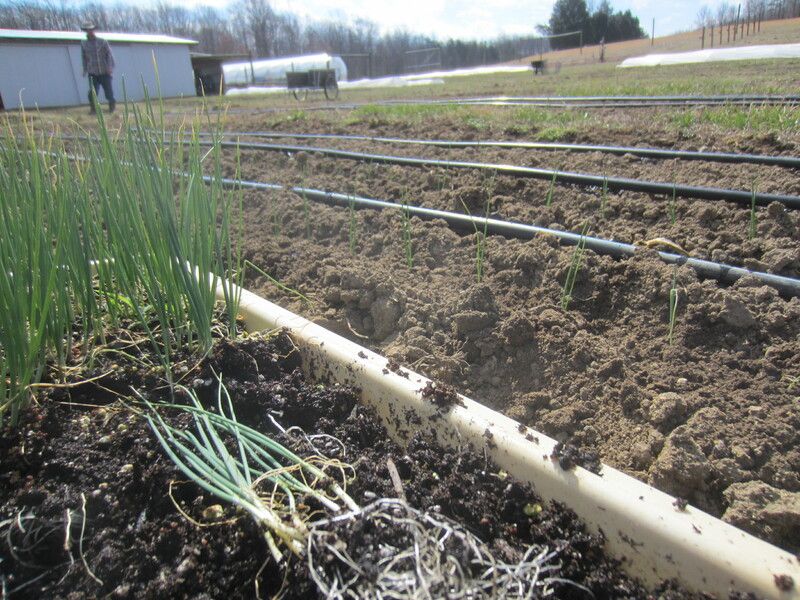 Everything looks great, it’s nice you’ve been able to remain productive despite the long, wet winter. I’m trying tomato grafting this season as well but just planted my seeds yesterday. 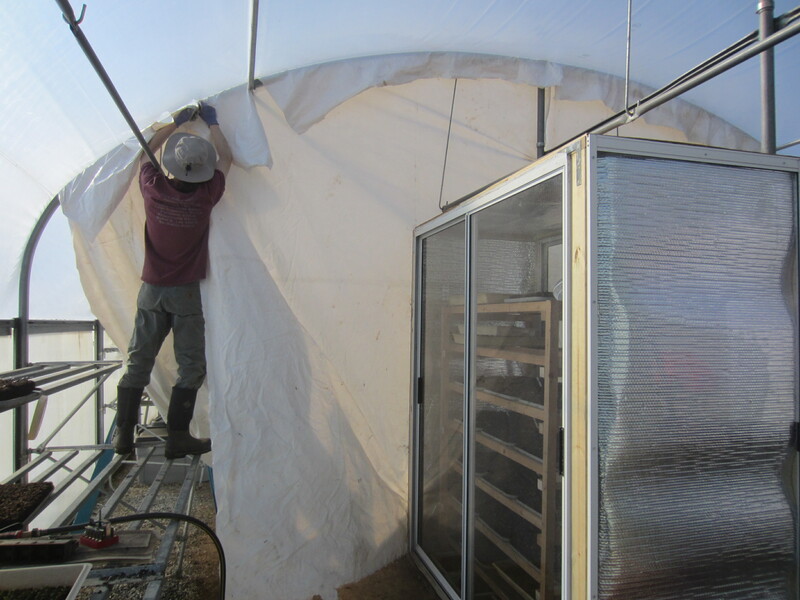 Having to stoke the fire in the greenhouse twice nightly is a bummer, particularly in the “off” season when you have the opportunity to enjoy the luxury of sleep. Keep up the great work, you guys are an inspiration to all of us who desire sustainable, locally produced, chemical free food. Thanks, Kevin. Hope you have good success with the tomato grafting. It’s been a lot of reading and you-tube watching over here trying to get the process down. Always fun to try a little farm experiment!